rear. It has an unusual asymmetric composition, with a central tower (with lunettes) and a corner turret topped by a lantern. Fine polychrome brickwork on the facade is highlighted by unpainted cement render detailing, arches, impost string courses, pilasters and bracketed cornices. The pedimental motif in the parapet (originally repeated twice on the west elevation) is unusual, with a scalloped motif in the tympanum. Stilted arches are employed above the windows on the upper floor. The central entrance is topped by an elegant fanlight. 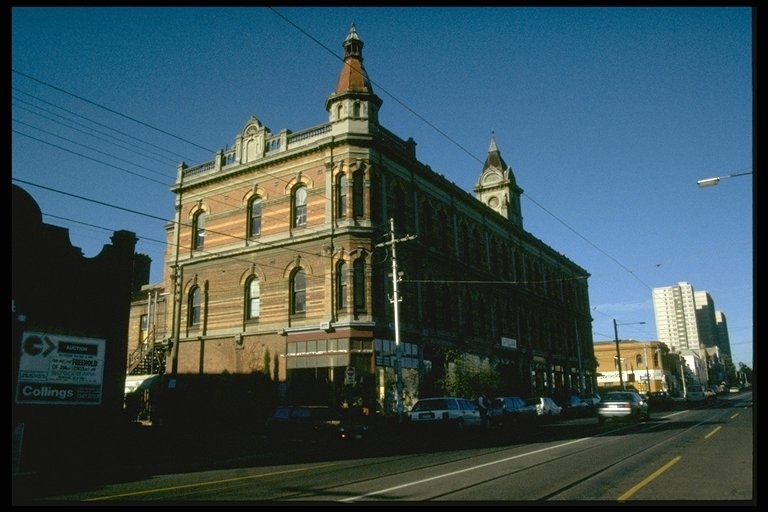 The Shops at 236-252 Brunswick Street Fitzroy are of historical and architectural significance to the State of Victoria. 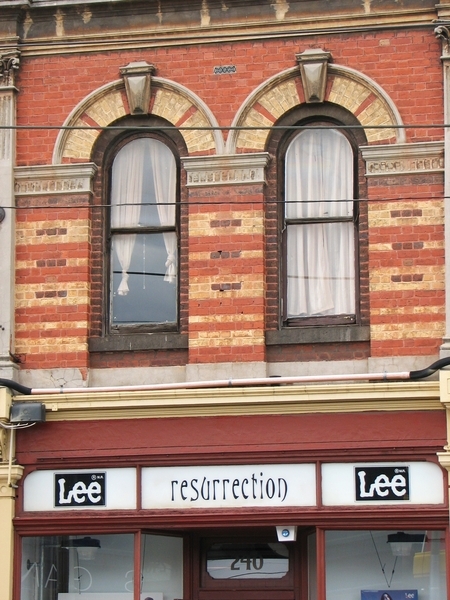 The Shops at 236-252 Brunswick Street Fitzroy are of historical significance as rare examples of 1880s boom-era speculative building, and for the evidence they provide about the organisation of real estate finance in the latter decades of the 19th century. The shops were speculatively built and were typical of the kind of venture engaged in by the Australian Property and Investment Co. Ltd., one of the many companies floated towards the end of the boom years as a result of a deliberate reduction in the money supply initiated by the banks in order to curb inflation. The company was floated in 1888 by F. J. Derham, postmaster-general and managing director of Swallow and Ariell Ltd, originally for the purposes of raising capital to complete the construction of the now-demolished Australian Building. It attracted such diverse people as Alfred Deakin and James Munro to its directorship. The company’s fortunes reflected those of many companies when the boom turned to bust in the 1890s. When office space became increasingly difficult to let, speculative companies such as the Australian Property Investment Co. found themselves in great trouble and Munro's real estate bank bought out the assets of the company when it collapsed. 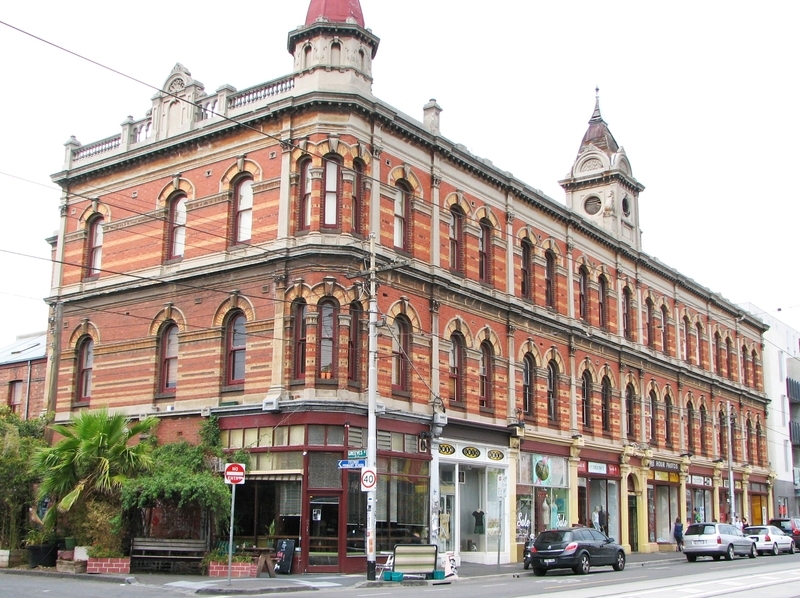 The Shops at 236-252 Brunswick Street Fitzroy are of historical significance as dominant landmarks in the city of Fitzroy and as important parts of the Greeves Street/Brunswick Street precinct, with its substantial 19th century streetscapes. 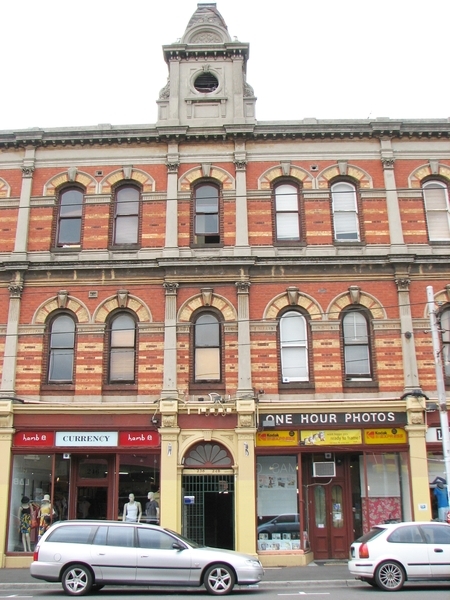 The Shops at 236-252 Brunswick Street Fitzroy are of architectural significance as rare examples of 1880s speculative commercial property development. The architecture of the buildings is unusual and flamboyant, reflecting the wealth and optimism of their time of construction as well as the speculative builder’s need to attract attention to his product. The shops incorporate a wide variety of elements in an asymmetric manner, including the central tower and corner turret, topped with a lantern and placed over a corner splay, the use of stilted and semi-circular arched windows, impost string courses, pilasters, a bracketed cornice and a continuous balustraded parapet with decorated pediments. The eclectic nature of the building is symptomatic not only of its speculative purpose but also of the work of its architect John Beswicke, one of the more innovative and eclectic designers in Melbourne at that time. In many ways this building has a marked similarity with Beswicke's own house, "Rotha" in Hawthorn (1887-88) in that they both use asymmetrically placed elements, particularly above the roof line, with little regard to the formalities of rational design. Both buildings are suggestive of the French Renaissance revival and presage later trends in Edwardian architecture, particularly in the use of diagonal corner elements. Historic Building No. 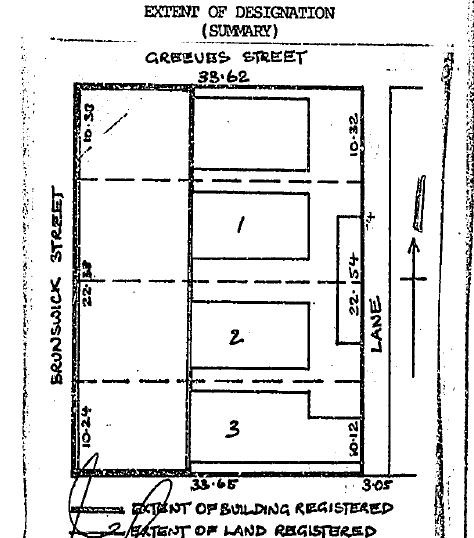 559, 236-252 Brunswick Street, Fitzroy (to the extent of the exterior of the three storey part of the building, being that part contained within a depth of approximately 13.7 metres from the Brunswick Street alignment, and the land entered in the Register Book as Volume 4598 Folio 583; Volume 8169 Folio 255; Volume 8057 Folio 241 and Volume 7917 Folio 005).